On the menu tonight... 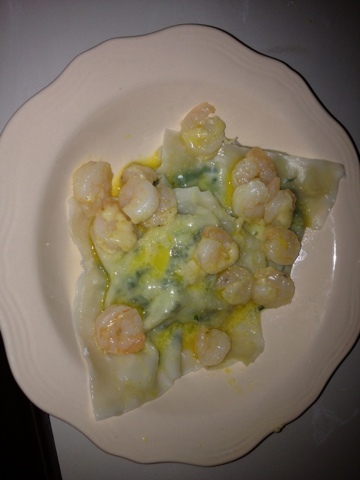 Spinach and ricotta (low fat) ravioli made from all natural wonton wrappers. I needed more protein so I boiled some shrimp. I topped it with a garlic butter (Smart Balance -- Light!) sauce and a little shredded parmesan cheese. It looks much more buttery and yellow in this picture than it actually was. I think it was because the ravioli were still a little wet. If you look closely you can see how watery it is. Honestly each time I see this it looks more and more disgusting. I assure you, it wasn't that buttery. Note to self: drain better next time. Overall it was good and I will make it again! Haha... This tasted MUCH better than it looks!